L. M. Montgomery's poetry is not really very good from the critics' perspective. It's said to feel more forced and written from memory than emotion. It's simplistic to a degree but I don't mind this because it makes it easy to understand. It's effortless reading which takes me back to my own trek to Prince Edward Island. I can read her poems and feel the air and see the rolling hills and the sun setting and I love it. I love this poetry for pure sentimental reasons and I don't know that that's such a bad thing. It is poetry I can relate to and if you think I'm awful for not liking poetry to begin with, well then you have to confess that this poetry is better than no poetry at all! Right?! I'd like to think so. Of summer and blossom and bird! When the pulses of Nature are stirred. Montgomery lived a rather secluded lifestyle with her grandparents. It doesn't appear that she had a very large social circle and she spent a great deal of time alone and out of doors. She felt most alive and invigorated by exploring the world around her. Apparently she was a tree hugger of the literal sort, feeling great affection towards plants that were placed in her care. And dream one dream of boyhood 'neath our father's roof once more! With a meaning of strange delight. Has the power of a holy prayer. Shuts out every thought of care. 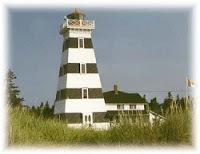 The following poem is my favorite in The Poetry Of Lucy Maud Montgomery because it reminds me the most of my stay at the West Point Lighthouse which is the only operating lighthouse on PEI that also acts as an Inn. My friends and I stayed here one night and took a moonlit walk on the beach before going to bed. Marvelous, marvelous, marvelous experience! Oh, how I would LOVE to go back! FYI - Abegweit is the name used by the Mi'kmaq Nation (natives to Canada) to refer to Prince Edward Island. The magic ritual of our northern woods. I turn to the enchantment of the shore. I send my heart and hope with you tonight. I wouldn't spend a great deal of time mulling over Montgomery's poetry but it is rather fun to just dive into when you want to dream about Prince Edward Island a little. I bought my copy at the site of Montgomery's Cavandish Home (and it is officially stamped as being purchased there) so it makes it a sentimental souvenir for me. 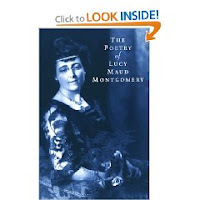 I think any Montgomery fan would benefit by reading her poetry since it was something that Montgomery connected with and loved. It is obvious she spent some time and attention on poetry. She loved reading it and she had something of a love affair with the idea of creating poetry of her owns. I don't necessarily understand that love but what I do understand is the love of the land she was raised on. It's easy to feel dreamy just thinking about it. And that's about as romantic as I'm going to ever get in talking about poetry! Here you have it! Enjoy. This takes me back to my own jaunt to PEI. Thanks, Carrie! I love the translation of Abegweit - "cradled in the waves" - our Island is shaped like a cradle. Here is a link for quite a few of LMM's poems if your readers are interested.